Quarter Sawn or Quarter Sliced wood veneer is a standard and beautiful way to create wood veneer. Quarter slicing simulates the quarter sawing process of solid lumber, roughly parallel to a radius line through the log segment. In many species the individual leaves are narrow as a result. A series of stripes is produced, varying in density and thickness from species to species. “Fleck” (sometimes called flake) is a characteristic of this slicing method in Red and White Oak. Quarter Sawn wood can be produced with many wood species and has a linear grain outcome. Rift veneers are produced most often in Red and White Oak, rarely in other species. 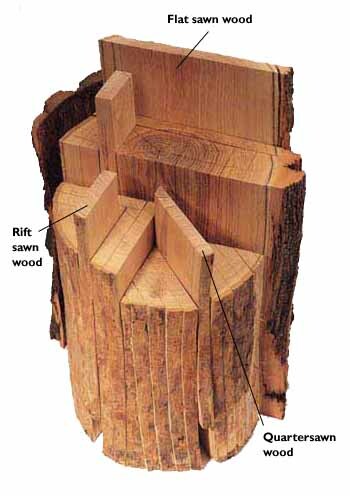 Note that rift veneers and rift sawn solid lumber are produced so differently that a “match” between rift veneers and rift sawn solid lumber is highly unlikely. In both cases the cutting is done slightly off the radius lines minimizing the “fleck” (sometimes called flake) associated with quarter slicing. Comb grain, which is limited in availability, is a select product of the Rift process distinguished by tight, straight grain along the entire length of the veneer. Slight angle in the grain is allowed. Comb grain is restricted to Red and White Oak veneers. The log is center mounted on a lathe and “peeled” along the general path of the growth rings like unwinding a roll of paper, providing a generally bold random appearance. Rotary cut veneers may vary in width and matching at veneer joints is extremely difficult. Almost all softwood veneers are cut this way. Except for a specific design effect, rotary veneers are the least useful in fine architectural woodwork. Note: Rotary sliced fine hardwood veneers are used in a limited way, and usually for special figure and cut, in the manufacture of Premium Grade woodwork. Careful consideration,specification, and communication are recommended when rotary cut is contemplated. Wood Veneer is something we quite frequently have to specify in the Interior Design Profession, and understanding the different options available is crucial to a projects design success. According to the American Woodworking Institute Standards (AWI) their are 4 common practices for supplying veneer from a log- Rotary Cut, Rift Cut, Quarter Sawn, and Plain Sliced. All of the cuts produce different wood grain directions and patterns, and they vary in price as well since production is different for each cut. I like to see a nice quarter sawn veneer on the woodwork I specify, it just has a lovely grain pattern and always seems to establish a nice understated design. The Free Flow is a new sofa manufactured by Moroso and designed by Gordon Guillaumier. It's fantastic and functional! Since 1952 Moroso, an Italian company, has been designing + manufacturing sofas, armchairs and accessories with excellent and distinguished designers such as Carlo Colombo, Enrico Franzolini, Marc Newson, Toshiyuki Kita and Patricia Urquiola. Moroso is known for their attention to detail and top quality products. A more organic tile pattern is so refreshing! The not so organized, yet very definitive tile pattern accentuates the use of the space--the sink/handwashing area. On a floor or even on a wall, this meandering tile pattern has caught my eye and is a unique way to define a space. Moss, a new modular seating collection from Keilhauer has the simplicity and durability necessary for the commercial interior design market. With 3 pieces each in 2 different lengths, the configuration options seem endless! The product is also GREENGUARD certified, making it a great contender for higher education and healthcare work. The future of whiteboards is here! Paint any wall with a write-and -erase surface! Genius Idea! Wolf Gordon has developed a new type of "wallcovering". The low VOC (Volitile Organic Compound), water-based formula is sold in a kit that covers up to 90 square feet. The clear finish turns any paintable surface into a sketch, design, and erase surface! Dot Tile 100% Recycled Glass! Fireclay tile recently introduced a new 100% recycled glass tile made in America. The San Jose, California company has a variety of sizes in the new collection called CRUSH. I especially like the dot tile. The playful round pattern has a wide variety of appropriate applications!